August last year saw us looking at the Netgear Nighthawk XR500 Gaming Router, while it impressed us, the large pricetag and the lack of some basic features as well as shockingly bad build quality did leave a bit of a bad taste. Now, 6 months on, we’re testing the Netgear Nighthawk XR700, the evolution of the previous router with many new features. Improvements over the previous model include a quad core processor clocked at 1.7GHz, 512MB of flash memory and 1GB of RAM, which is roughly double of the XR500 in all three measures. There’s also a stronger, and larger chassis, more colourful design and chunkier antennas. However, while the aesthetic differences, as well as improvements to processing ability, might seem well and good, the true improvements lie within the introduction of 60GHz 802.11ad WiFi, offering speeds up to 7200Mbps through wireless transmissions. Furthermore, Netgear have upped the number of Gigabit ports from 4 to 6 and included a seventh 10Gig port for users requiring incredibly fast file transfers (A compatible SFP+ module or DAC is required and isn’t included). Netgear’s DumaOS was introduced with the XR500 and continues into the XR700, the software allows users control over QoS settings and Geo-Filterin to maintain low pings and high bandwidth to the devices that matter. Finally, the price, which also gets a decent bump over the previous model, at £450 in the UK ($450 in the US and $730 in Oz), you certainly need to have a genuine need for such speed and control over your network, or are the headline improvements enough to warrant such a rise in price? Let’s find out. Nighthawk Pro Gaming is designed for the ultimate gaming performance. 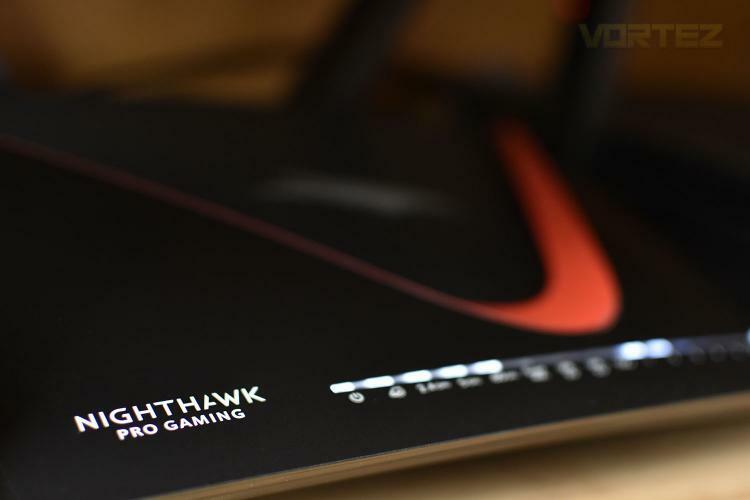 The XR500 Router takes the best-in-class Nighthawk features with cutting edge software, giving you the power to win. Compete in FPS games and make sure that your Twitch stream has the highest quality with stability. Optimize game performance and kill lag before network issues arise.